Last week, Tyler gave an overview of our recent road trip through New England and talked about the camera we rented for the trip. Our itinerary for this trip was perfect, if I do say so myself. We really hit the highlights of the Northeast: the rolling golden mountains of Southern Vermont, the sleepy beachy vibes on the Atlantic, and all of the history and culture Boston has to offer. We spent two days exploring the countryside of Vermont. Like Ty mentioned in his post, we arrived a bit too early to catch peak “leaf-peeping” fall foliage (about 2-3 weeks later than our visit). Nonetheless, it didn’t take much for us to fall in love. The area’s scenery was absolutely beautiful, but our favorite part of visiting Vermont was discovering all of the awesome local businesses. It seemed to be a common theme that each owner we met wholeheartedly supported the others in the area and couldn’t be more proud to live in Vermont. For example, each coffee shop we went in either roasted their own beans or got them from a roaster nearby, and they sold cider donuts from the orchard down the road or muffins from the bakery in the next town over. We found so many gems on this leg of the trip and have organized them into two very full days here in this post. 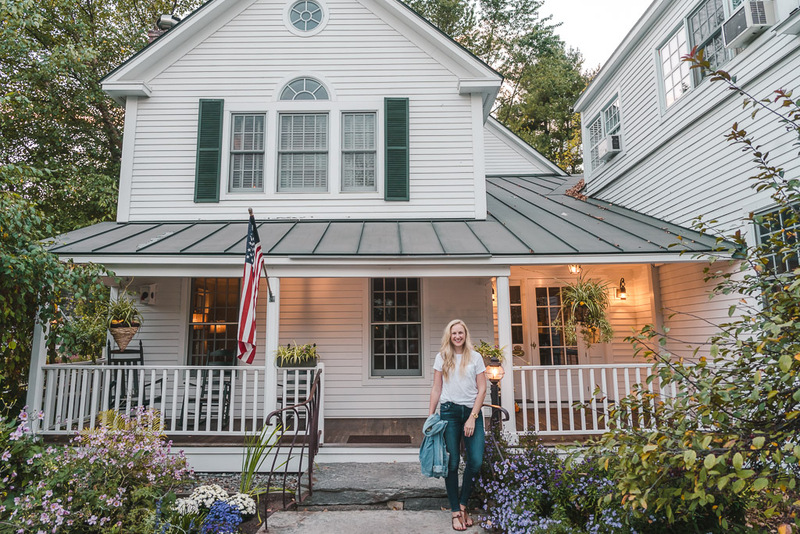 We cannot speak highly enough of our stay at the Four Columns Inn in Newfane, Vermont. The rooms at the Four Columns are flawlessly romantic and SO cozy. I’m a sucker for good hotel decor, what can I say? There’s something just so comforting about staying in a room that has been thoughtfully curated. Oh, and a good fireplace, am I right? In terms of hospitality, the team here really gets it right. The staff was warm, friendly, and took the time to help us map out our stay. ALSO, note that a fabulous sit-down Vermont breakfast is included with your stay. Be sure to thank the free-roaming chickens on the property for your fresh scrambled eggs. Because the Four Columns property is so homey and picturesque, it really took some concerted effort to get in our car to go explore elsewhere each day. A creek runs through the back of the property, and there’s a natural pool area and a small lake. Feeling the need for some pampering? Reserve a massage outside overlooking the lake. I can’t talk about the Four Columns without bringing up the dinner we ate there because it was life-changing (I say that a lot but I MEAN it this time). I mentioned this already on our Instagram, but Ty and I keep a running list of our “Top Five Most Memorable Meals.” With one glance at the peach burrata appetizer, we knew the Four Columns had broken into the ranks. Executive Chef Erin Bevan of the Four Columns handcrafts each Italian-inspired meal with a creative spin. She presents each guest with what she describes as “comfort food,” created with all locally sourced farm to table ingredients. Even if you don’t stay at the Four Columns (though you certainly should), PLEASE take our word for it and make the trip to Newfane for dinner. We were very gloomy the morning we left the Four Columns Inn and are already looking for excuses to return. Kick off your first day with a true taste of Vermont at the Scott Farm Apple Orchard. The biggest draw of this orchard is the sprawling hills and stunning scenery surrounding it. Find every apple-related edible item you can think of at the little store on the property, and then set out to pick your own apples in the orchard. We just so happened to visit Scott Farm during a cider tasting event. We had a blast learning about a bunch of different ciders, all made right in Vermont. A bout of hangry car sickness (guess who) led to our discovery of the Putney Food Co-op. This is a great midday stop to fuel up on your tour. Order the BLT and enjoy some fresh (and delicious) coffee! I didn’t realize Tyler had such a passion for maple syrup until our stop at Hidden Springs Maple in Putney. But sure enough, within seconds of our arrival, he was running around shouting facts about maple tapping and shoving samples down my throat. This little store has maple everything. And yes, he did insist on purchasing the leaf-shaped glass bottle of Vermont syrup. Another must-hit family-run orchard in Vermont’s countryside. Green Mountain Orchard seemed to be much bigger than Scott Farm and boasts a long list of produce (besides just apples) that visitors can pick, including blueberries, peaches, and pumpkins. Think of this place like a step up from Schrute Farms, minus the beets. And don’t forget to try the cider donuts here. I don’t even like donuts and loved these. This breathtaking route winds past farms and through golden forests until it reaches the top of Hogback Mountain. Definitely leave time in your itinerary to stop every ten minutes on the drive. The deck by the general store provides sweeping views of mountains in both New Hampshire and Massachusetts! Wilmington, just down the highway from Hogback Mountain, ended up being our favorite town in Vermont. First of all, we just so happened to stumble upon Coffee House, home of my new favorite coffee ever. We were obsessed with home-brewed hazelnut iced coffee kept cold by ice cubes MADE with iced coffee. Are we the only ones who haven’t heard of this before? The owner of this adorable shop told us that the coffee ice cubes are a bit labor-intensive but a true fan favorite. After spending 30 minutes swooning and sending pictures of my coffee to my sisters, we ate lunch at Village Roost. Go here for a delicious meal (specifically, the falafel wrap) and board games by a fireplace. If you are into reading, make sure to check out Bartleby’s Books across the street. From Wilmington, we set off up the 100 to Manchester. (Hopefully Tyler doesn’t proofread this far down to see my use of “the” before THE 100… NorCal vs. SoCal relationship problems). Since the route from Wilmington to Manchester goes further north, we finally experienced the true meaning of “fall foliage” on this drive. The trees lit up a deep red and vibrant orange, and my gets-cold-in-the-high-sixties self was in awe. We recommend spending at least an afternoon and evening in Manchester. I wandered the Northshire Bookstore for way too long and advise you do the same. (I’m sorry, did you think there would be only one bookstore on this guide?). Head to the Silver Fork for dinner, and don’t forget dessert (at Ben & Jerry’s, duh). We loved every second of our time in this gorgeous area of the country. We felt like this trip really gave us a renewed appreciation for domestic travel. If you get the chance, we HIGHLY recommend visiting Vermont in the fall at least once in your lifetime. Awesome blog. Thanks for sharing it. We live in the Toronto area so we enjoy the spectacular colours in our area each Fall. We have been through that area as well. So much beauty to enjoy! Glad that you had such a good trip. Vermont in the fall of the year is definitely on my bucket list. I’d like to follow your itinerary. ?❤️?